Cheese Beer Wine Cider: A Field Guide to 75 Perfect Pairings is a new guide to pairing cheese with, well, beer, wine and cider. 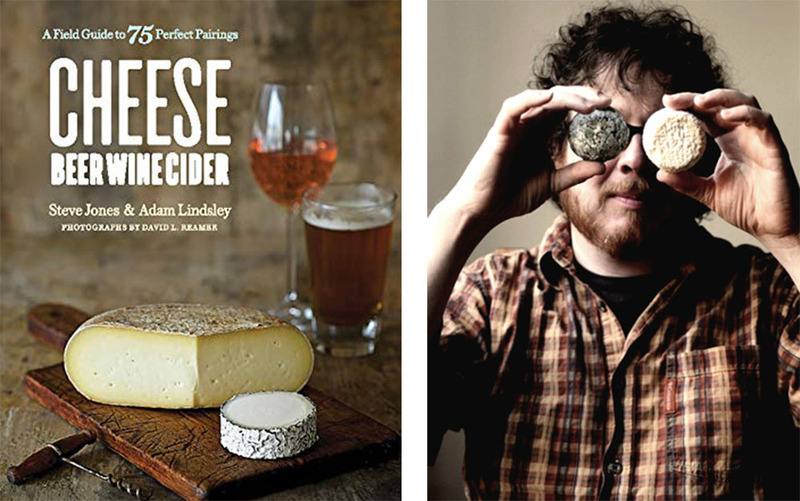 Written by Steve Jones and Adam Lindsley with photographs by David L. Reamer, this book was created for everyone, from the beginner cheese pair-er, to the die-hard cheese-pairing enthusiasts. Steve Jones is the proprietor of the Portland-based Cheese Bar and Chizu (cheese served sushi-style). He started out working at a wine shop, setting up the cheese selections. He draws on this experience, and subsequently becoming a cheese pairing consultant, to create his guide. The 224 page book is divided into three parts: an overview about cheese “rules”, alcohol “primer”, and making pairings; the actual pairing details; and final thoughts with additional pairings thrown in for fun. The book reads like a conversation with a friend. Jones and Lindsley really know what it’s like to be a cheese lover. For example, the first rule of buying, storing and serving cheese is not to buy more than you can eat in a week. Which, let’s be honest, is a rule all cheese lovers break. A few chuckles are peppered throughout the book as well. (“When you freeze cheese, you’re proudly announcing to the world, ‘I don’t deserve nice things.’”) This adds levity to what could have become something more akin to a textbook – aka, informative but dry. The pairing section includes details about the cheese (country of origin, type, alternative cheeses), the details about the pairing (country of origin, style), information “About the Cheese”, which explains the taste and history of the cheese, as well as the result when you eat the two together. Reading these pairing descriptions gives a good idea of what to expect. Plus, the colourful descriptions are entertaining. Which is a plus. If you’re not a big reader, the Cheese Beer Wine Cider: A Field Guide to 75 Perfect Pairings also includes a few handy charts: how much cheese you should buy for a cheese-tasting party; additional pairings with the cheese type listed and then drink type, which is more my pace when it comes to handy references; and “quick bite” sections throughout that give bite-sized details about a variety of topics adjacent to cheese and wine.